Genetic Genealogy Ireland: The Tribes of Galway make a comeback! The Tribes of Galway make a comeback! Back in 2013, during the first annual conference of Genetic Genealogy Ireland, we had a wonderful presentation from Adrian Martyn on the fourteen Tribes of Galway, based on his extensive research. There was a huge amount of interest in the topic then, and there has been ever since, with over 2000 people viewing the YouTube video of his presentation online. For many years now, Adrian has been working on publishing a book of all his research and I am delighted to announce that this eagerly awaited publication has now been realised. You can order your own copy via Adrian's website on the link below. This would make an excellent Christmas present (for yourself or others) and comes highly recommended. 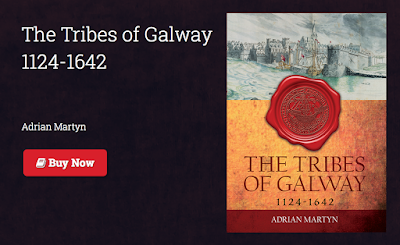 "Fourteen families from the medieval Irish lower-classes rose to become Galway’s prime merchant families, nicknamed the tribus Galvia in the 1600s. The families of Athy, Blake, Bodkin, Browne, Darcy, Deane, Font, French, Joyce, Kirwan, Lynch, Martyn, Morris, Skerrett, have been THE TRIBES OF GALWAY ever since. Over the course of four centuries, they and their fellow Galwegians survived and often thrived against warlords and sieges, during economic booms and busts, times of plenty, famine, and plague. All within Europe’s most westerly urban settlement. This is their story." Some of Adrian's academic papers can be downloaded and read free of charge from Academia.edu. 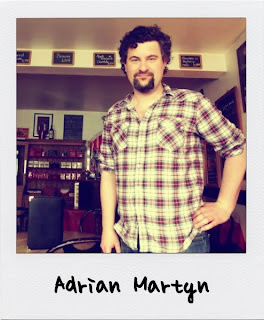 And here is Adrian's presentation from GGI2013 ... it starts at 1 minute 22 seconds, so skip ahead to the good bits! You can view a larger version on YouTube here.